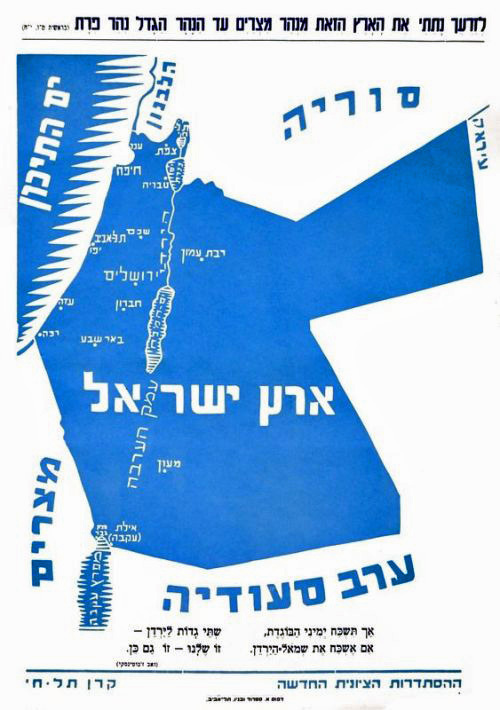 The poster is an Irgun publication published around 1947, though it only mentions the New Zionist Organization and the Tel Hai Fund. The title is Genesis 15:18 (“Unto thy seed have I given this land, from the river of Egypt unto the great river, the river Euphrates”) and the map shows all of mandatory Palestine and Transjordan, labeled as Land of Israel. Amman is labeled “Rabbat Ammon”, its Biblical name, while Eilat and Aqaba are labeled as “Eilat (Aqaba)”. The third Jordanian city is labeled Meon, possibly a reference to Beth-Baal Meon, another Biblical city, but the location looks wrong for that. At the bottom are quotes from Zeev Jabotinski: “The river Jordan has two banks: one is ours, and so is the other” and “Let my right hand wither if I forget the east side of the Jordan”.